Have you ever wondered what it might be like to be make a pitch on ABC’s Shark Tank? Today’s guest has been there and done that, and in today’s episode, she’ll share some of what she learned in the process. Marylou: Hi everybody, it’s Marylou Tyler. This week’s incredible guest is Michelle Weinstein. The cool thing about her is, she’s the only person on the planet that I know that has been on ABC’s Shark Tank. She’s here to talk to us today about how to be a better entrepreneur. She’s got some great years of experience, 20 plus years. She’s done a ton a stuff. She’s raised money, she’s land contracts with big clients like Costco and Vitamin Shoppe. Of course, the Shark Tank thing is above cool. Michelle, welcome to the podcast. Happy to have you. Michelle: Thank you so much for having me. It’s an honor to be here. Marylou: This is great. I want to know all about Shark Tank but I’m sure we want to weave that into the conversation. I’m curious, you’re a woman in sales, there’s very few of us in the planet. What got you started into this beautiful career that we love but it’s tough for women to break into. How did you do that? higher level sales by going through some of their training programs. I said, “If I’m going to be here, let me see what this Nordstrom training thing is all about.” That’s really where I learned that I was really good at sales. sales or if you’re an entrepreneur, you signed up for 24×7 sales career. Anyone who’s in business for themselves, you’re selling all they wanted. I was actually talking to a mom the other day, and she said, “You know, as a mom I’m a salesperson all day long too.” I’m like, “Yeah, I guess so.” I’m not a mom but I could see it. That’s really how it all started. would allow you or give you permission to explore this field where you’re now teaching business owners and entrepreneurs how to do what you do. Michelle: Yeah, and that’s exactly right. I think I’m always still learning. I even have a friend who I’ve met and we do a lot of role playing still because you can’t be the best at your craft if you stop learning. If you want to be able to charge premium prices and you want to be able to be at the top of your game, I equate it to the top-paid NFL quarterback in NFL. That person isn’t the top-paid person because they stop throwing the ball. They actually went above and beyond and probably did more on their nutrition side. They probably did more on their workouts. They probably watched more film. They probably evolved. Whatever it was, they always worked on their game. I believe as entrepreneurs or whatever your exact craft is, we always have to be learning. I always look for other sales courses, even if I can learn one new thing from one course or one place, then I can be that much better. That’s really what this is all about. Marylou: And you probably also put that one thing into action, to start testing it, to see if it’s something that would fit into your normal rhythms. history of that? How did that all start and what were some of the milestones that you took along the way that our audience can relate to as they’re trying to generate new business in their companies or if they’re entrepreneurs, to build revenue for their companies. Was there a correlation that you found in getting to Shark Tank, and if so, what did that look like? started engaging with them. I sent emails. I applied online and I think I hit every single angle that I got a response. I think everything that we do, you have to think about it as—I called my Shark Tank experience—going to the Olympics. For some of my friends that have been to the Olympics, you have to go to the trials. First, you do your regionals, then you go to the Olympic trials, and then if you make the trials, then you actually get to go to the Olympics. This wasn’t any different and it correlates 1000% with gaining a really big client. If it’s in the multi-million dollar type contracts or any significant, large contract or customer? You can’t just wing it. You have to prepare. I did season four and one of the others ways I prepared is, I watched season one, two, and three. I made a spreadsheet—obviously, my nickname was Spreadsheet and all I know how to use was Excel—and I documented every single pitch and deal from season one, two, and three, and studied the questions that were asked. I had all the answers; I saw the ratios as far as how much are people giving up their companies versus how much the investment was. I did so much due diligence. I ran Shark Tank pitches with my current investors I had at the time at my house and we did practice sessions with the questions, what I research from writing all the questions out. I prepared, you get to really learn, and I think for each person listening, how to be an unknown. Honestly, when you can get comfortable with being comfortable in the unknown, which is very uncomfortable, then that’s where I think a lot of magic is created. That was the Shark Tank experience, pretty much from July whenever, I taped, I probably applied three to four months prior, and every time they hang up the phone with you, they say, “We’ll let you know what the next step is and just know that there are no guarantees.” Every single call and email, that’s what you would hear, “Just so you know there’s nothing guaranteed. Just so you know, you might not hear about from us.” It was nuts to even think that that was even possible and they say until you see yourself on TV, then that’s when you know it’s real. Here’s the funny thing. Well, now it’s funny, at the time it wasn’t. One third of every single taping, doesn’t air. If they had 140 […] actually pitch and tape. Prior to that, they send people home because you have to pitch to the producers prior. If you don’t pass the producer pitch then you get sent home. My episode number aired after all of that but I said that experience is what helped me with my last company. I pitched to Vitamin Shoppe a really outside-the-box idea to really change the supplement industry to more of a preventative approach, and we were able to do a 10-store test inside Vitamin Shoppe. I was meeting the CEO of a multi-billion dollar company. That experience of preparation for Shark Tank got me prepared for anything. uncomfortable, being comfortable, and being in the unknown. need to do at the step you’re at in order to earn the right to either go to the next step in the active pipeline or put them to sleep for a while because they’re not a good fit right now, or actually get them out because they’re definitely never going to come back into the active pipeline. You’ve set that stage that each step is important, each step has meaning, and each step earned you that right to go to the next step. It’s so great that you had that experience. Let’s take that experience now and let’s focus on The Pitch Queen. What aspects of the Shark Tank or that experience do you instill now in your troops? In your business owners, entrepreneurs, and people who love to work with you, where do they start? Is there a mountain they’re climbing or do you spoon feed them with the various pieces of information that they need in order to skyrocket their revenue? $50,000–$100,000, what is that process of selling and building that relationship with that type of client, and how do you service that type of client at that level. That’s really what my main focus is. It’s really on the high offer, high value service process of selling. to work with, there’s really great ways on how you can follow up and how you can do it in a professional manner. I would say that even The Vitamin Shoppe or Costco or anyone that I’ve worked with in the last eight years, they say that that is the quality that I have and now I teach it to people. I think a lot of times we might be feeling this too in the beginning stages of when you are selling or starting your business. You don’t want to annoy people. You don’t want to be, not only annoying, but you don’t want to bother them. Well, to be honest, if you’ve got something great or you got a solution to a massive problem and I believe that every single thing I do today or the clients I worked with, you have to have a significant solution to a massive problem. If you don’t follow up or you think you’re bothering them but you have the solution, then you’re actually doing them a disservice, or you’re doing that company a disservice. If The Vitamin Shoppe told me, “We really want to be different that GNC and everyone else,” and I had these fresh prepared meals, and I was 1000% that this would differentiate them. I knew that I could execute and make this big, huge project happen. If I didn’t follow up, they would have actually never worked with me. But they told me that because I was so persistent, that’s why they chose me over three of my other big competitors at the time, that were much larger companies than us. But they knew that because of my persistence and because of my willingness to pretty much go above and beyond, that that’s why they chose me and my company. can do it in a professional not annoying way, that you’re not bothering people, and that you’re actually there to wake them up. If you don’t wake these people up then you’re actually hurting them by not being persistent and following up. At that time with my food company, I was here to change lives one meal at a time. So that was my mission and you obviously have and mission and a passion that correlates with it, but that’s what helped everything and how I was able to get a lot of those B2B deals done. Marylou: As part of that, we’re getting drilled ad nauseam in our world about adding value for every sales conversation that you had, but there is no definition of what that means, adding value, adding value. Being professionally annoying is also adding value because each conversation that you choose to have does something so that the prospect recognizes that, “Wow, this is different. This is something that I want to learn about, get to know, have more conversations around.” That blueprint that you’re teaching your clients, what I call patiently persistent or pleasantly persistent. Michelle: Yeah, or I call professionally annoying—they’re all the same thing. a problem? 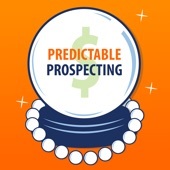 But if you open up their eyes to the possibility that maybe, for my CPAs, why their business isn’t over a million yet, well, a million in revenue means you need to increase your sales. If, you have a problem in your sales process or you just keep answering people’s crises, or when a client calls, say how much do you cost and you just give them a number, that’s a problem. But they don’t even know that that’s a sales problem. Michelle: For all of you who are doing some cold outreach, just remember, they don’t even really know if they have a problem. Marylou: They don’t. They’re unaware, like you said, they don’t know that they have a problem. They think they might have a small problem but they have no idea where to look for solutions. There’s five levels of awareness that we have to be prepared for in that sales conversation in order to be able to get them to bubble up. The other thing I found, is that we don’t define who we are and why we matter well enough in these conversations, so value is also about you. It’s about why people should change what they’re doing now and start having a conversation with you. It’s not all product-related at all, really at top of the funnel. Michelle: It has nothing to do with product. Michelle: It all has to do with relationship and the rapport that you build with the person because we all know that people buy from people. If it was about the product, Vitamin Shoppe would have never worked with us. Granted that we have a great product, but they were buying the person. Marylou: Exactly. So in our parting comments, I want to be respectful of our time with our folks. I’m going to put all the information of how people can reach you, on your page or website but let us know, tell us in parting what are the two or three actionable things that people can start today, after listening to this podcast? I heard planning, planning is one. Michelle: Planning yes. Also, take one thing that’s been on your to-do list and go do it, or one thing that you’ve been wanting to work on in your sales skills and actually implement it, not just talk about it. Marylou: Definitely. And then, you have a framework. You have a way of getting people to uncover this value. How do you spread out this value and become professionally annoying, but do so in a way that you have reason why to contact them multiple times. starting these conversations, we’re trying to build the relationship first before we start talking about product, feature, benefit, and results. We used to talk about results but we do it in a very emotional way to get people curious, fascinated, asking us, “Well, how do you do that?” and I think that that’s where, from what I heard in this conversation, you really excel in getting your folks to start moving in that direction. confidence in the conversations you’re having with people but also again how you bring value to them. Like you said, it’s all about value but for each person listening, each have a different product but just think about the human connection. It’s all about the human part of it. So hopefully, that will really make a big impact. You’ll be able to see that and again just go to sellwithoutsleaze.com, put in your best email and you’ll get my five steps system that really take the stress out of selling for good but also really build that confidence. guest here all day long, but if you actually don’t implement, then you’re not doing yourself any good and you’re not doing your clients any good. conversations into multiple steps are you’re working through the pipeline, from that initial conversation through the following-up sequences, and then on to the opportunity stage. For us it’s a must-have type of framework, so that you can craft the right conversation for each of the different people that you’re selling to along the way. As you’re moving these accounts from that first stage all the way through to opportunity, and then beyond, which I don’t cover, but Michelle probably covers all the way to close but you have information going on there. Wonderful. Thank you very much for your time and we will be sure to put all these links for everybody. Michelle: Oh, thank you so much. It was an honor to be here. Thanks again. Marylou: Okay. That’s a wrap. How did that feel for you? That was great. Really good. Marylou: Awesome tools and things that you put together. It’s so great, I love it. Michelle: Or email the stuff for when you’re in town, too. Marylou: Yes, I’ll get that over to you right away. Michelle: Because I want to put it in my calendar. list of the links that are there, that you want to look out like the, Sell Without Sleaze, the Coffee Is For Closers, are those all different websites? Michelle: No. The Coffee Is For Closers page is on my website. The Sell Without Sleaze is the only one and then the podcast page. If you want, I can just send them to you right now. Michelle: And then just let me know when it goes live and we’ll share it out for you. Marylou: Yes, I’m running about a month behind now, it looks like end of May-ish, somewhere around there, I’ll have a better idea. As I look through the schedule, but I think it’s around end of May, early June at this year. Marylou: All right. Thank you so much. I look forward to hopefully seeing you in person. Michelle: Thank you. Yeah, please. Send it. Marylou: I will. Take it easy, Michelle. Thanks again.